Elliott Nash (Glenn Ford) is a prominent television writer and director. Although he likes his job, it is a very stressful occupation and it’s made him very high strung. Not a bad person, he’s the type of man who nurses injured pigeons back to health, just stressed out a lot of the time. He and his Broadway star wife Nell (Debbie Reynolds) recently bought a house together in the suburbs so he can get away from the city and be able to relax a little. In addition to his job responsibilities, there’s something else that’s been eating Elliott up inside. Lately, he’s been getting phone calls from a man trying to blackmail him into paying him to keep some scandalous pictures of Nell out of the papers. But the blackmailer is asking for higher and higher amounts of money, more than he can afford at the moment. The only way he can get the money is to sell the house, but Nell just loves it and refuses to agree to selling it, despite Elliott’s best attempts to sabotage the home. When Nell purchases a historic gazebo to put in the backyard, it needs to be placed on a concrete foundation. When Elliott finds out it will take 24 hours for the concrete to set, Elliott decides to lure the blackmailer to his house by telling him he has the money so he can kill him and bury him in the backyard where the gazebo will be. Elliott goes through with the plan, despite a few mishaps along the way. 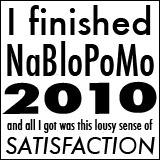 But then he later finds out that the real blackmailer was found dead in his apartment. So who is buried under the gazebo? Now this is a movie that’s well overdue to be rediscovered. Not your typical Debbie Reynolds flick, but if you appreciate dark humor, it’s a very funny movie. Glenn Ford was absolutely hilarious in the scene where he’s trying to carry out his murder plot and Debbie Reynolds is just a delight. I really liked Glenn Ford and Debbie Reynolds together as a duo. And since I mainly know Glenn Ford from movies like Gilda, Blackboard Jungle, and The Big Heat, seeing him in a more comedic role was a nice change of pace. 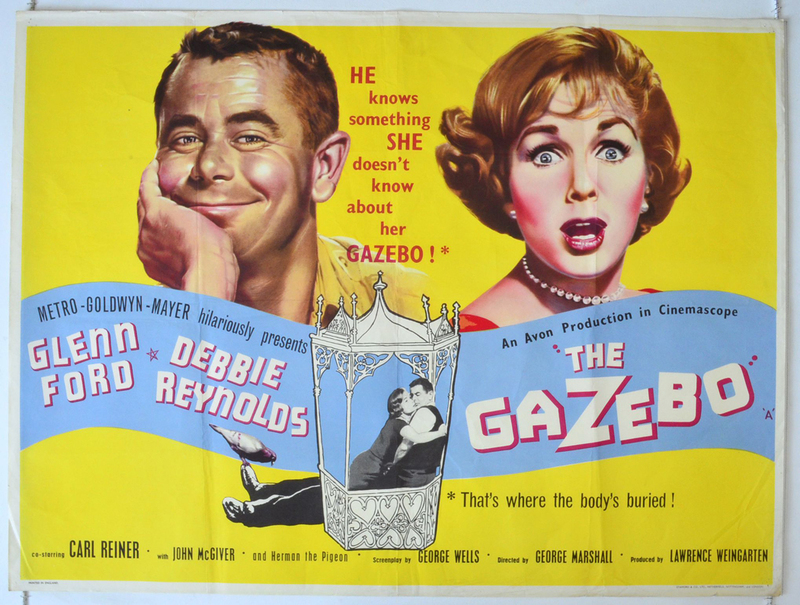 The Gazebo is also noteworthy for being the film debut of Carl Reiner and featuring John McGiver in a great supporting role. Given its offbeat style of comedy, it’s not going to be everybody’s cup of tea, but it was right up my alley. Posted in 1950s, Blogging Under the Stars, Comedies and tagged Carl Reiner, Debbie Reynolds, Glenn Ford, John McGiver on August 24, 2015 by Angela. Happy July, everyone! It looks like July is going to be a somewhat quiet month on TCM, but that’s okay with me since I know Summer Under the Stars is already right around the corner. 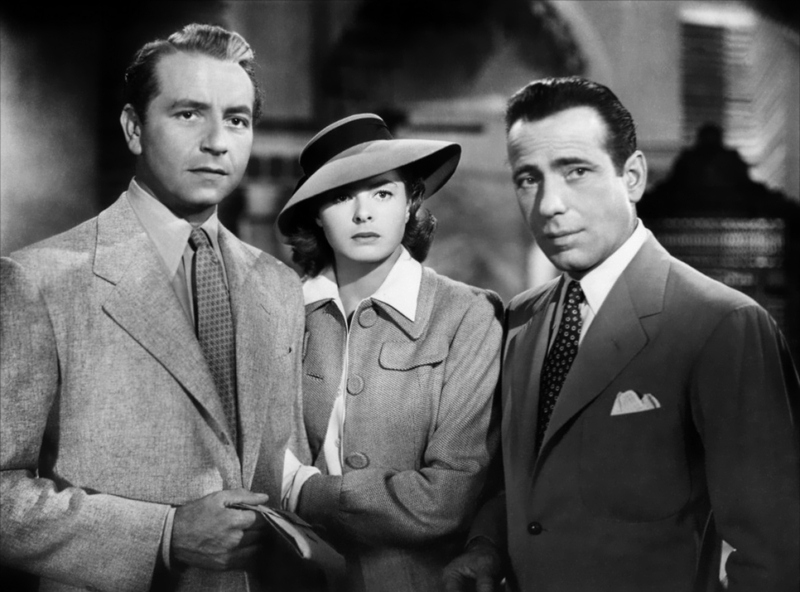 This month, we have Paul Henreid as the TCM Star of the Month and you’ll be able to catch his movies every Tuesday night in July. I’m pretty excited for July’s round of Friday Night Spotlight, which will be focused on the films of French director Francois Truffaut. If you’ve never seen a Truffaut film or haven’t seen very many of them, this is a perfect opportunity to see more of his work. This month will also feature Carson on TCM, a series of classic Tonight Show interviews by Johnny Carson, which I’m sure is going to be very fun. Rather than have just one Star of the Month for may, there will actually be several. 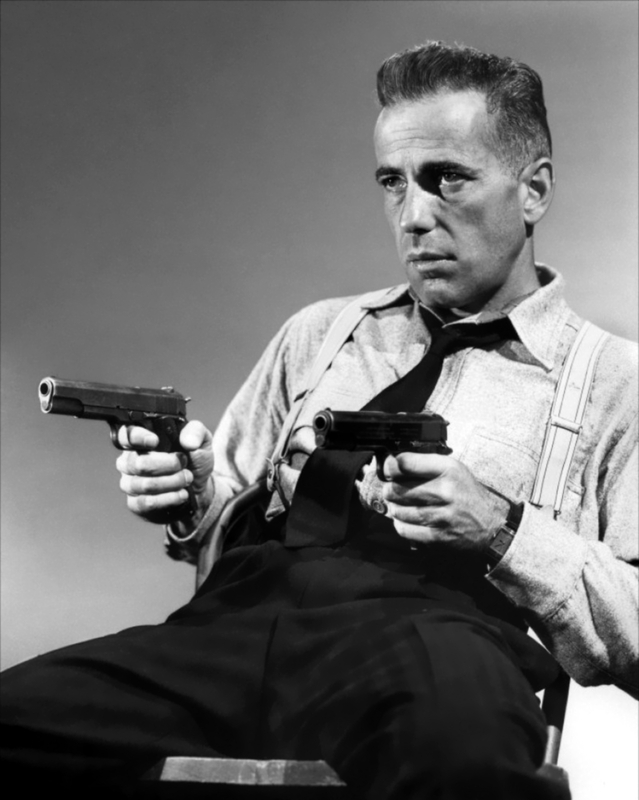 Every Tuesday night this month, TCM will be spotlighting some of cinema’s greatest tough guys, so that includes people like Bogart, Cagney, McQueen, and Robinson, just to name a few. Friday Night Spotlight will be back with Illeana Douglas as the guest co-host. Illeana has chosen the theme of “Second Looks.” All of the movies she’s chosen weren’t particularly well-received when they were first released, but she thinks they’re deserving of a second chance. I agree with several of her selections and since I’m all about those hidden gems, I’m really looking forward to seeing some of her other choices. If you’re a Harold Lloyd fan, mark May 23rd on your calendar because TCM will be playing his feature movies and short films all night long, the vast majority of which have never been shown on TCM before. Posted in TCM and tagged Bob Hope, Busby Berkeley, Elsa Lanchester, Glenn Ford, Harold Lloyd, James Stewart, Judy Garland, King Vidor, Orson Welles, Priscilla Lane, Rudolph Valentino on April 25, 2013 by Angela. Looks like we’re in for another busy month on TCM! 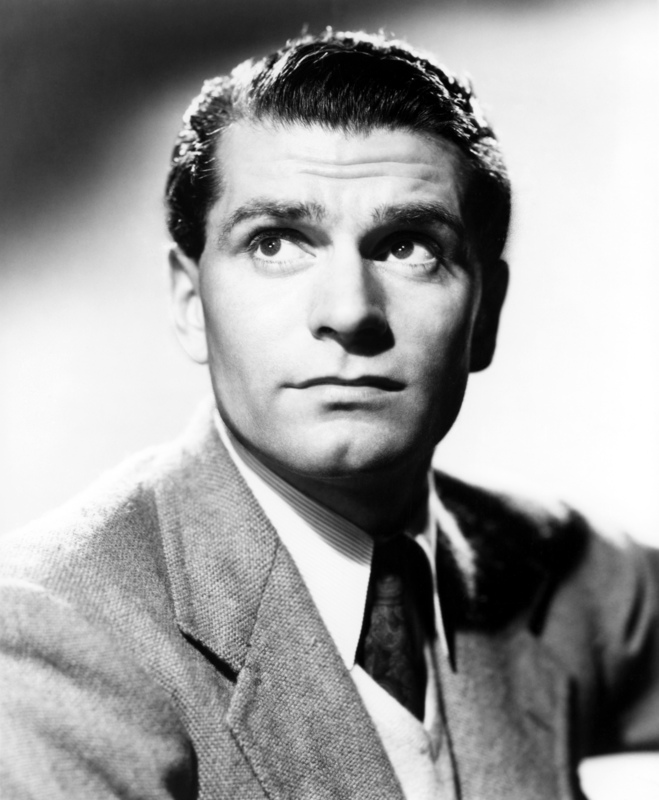 TCM has finally broken their long streak of making actresses the Star of the Month by giving the honor to Laurence Olivier in April. Starting this month, every Friday night will be dedicated to a new series called Friday Night Spotlight. 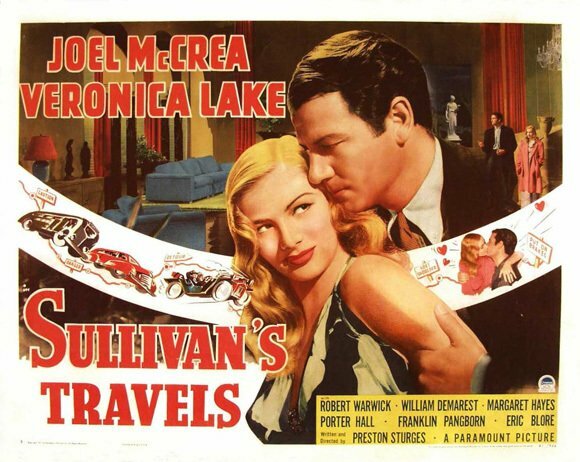 Each month, Robert Osborne and a different guest co-host will introduce films dealing with a particular theme. The first Friday Night Spotlight co-host is Cher, who has selected a number of movies with strong female characters, focusing on themes such as motherhood and women in the workplace each week. If you’re a fan of TCM Underground, be sure to note that starting this month, it has been moved from Friday to Saturday nights. The 2:00 AM start time remains the same, though. Posted in TCM and tagged Charlie Chaplin, Cher, Doris Day, Glenn Ford, Joan Bennett, Laurence Olivier, Linda Darnell, Lon Chaney, Marlon Brando, Melvyn Douglas, Richard Carlson on March 25, 2013 by Angela. For three years, Chris Emery (Rita Hayworth) has been living in Trinidad with her husband Neal. He’s an artist, she’s a nightclub singer and dancer. After one of her performances, she comes off stage to find Inspector Smythe (Torin Thatcher) waiting to break the news that her husband is dead. At first, the police believe he committed suicide, but they soon discover it was murder. Chris is ready to go back to America, but the police want her to stay and help them. They know that Neal’s friend Max Fabian (Alexander Scourby) is responsible for Neal’s death, but they also know that Max is the head of an organization that sells military secrets. To get the proof they need to convict him on that charge, they ask Chris to spy on him for them. Wanting to avoid an ugly murder trial, Chris agrees. A few days later, Neal’s brother Steve (Glenn Ford) arrives in Trinidad after receiving a letter from Neal about having a job for him down there. Not only is he shocked to find out about his brother’s death, but also that Chris is rumored to be romantically involved with Max. Chris wants to explain to him what she’s doing, but Inspector Smythe warns her not to. Determined to get to the bottom of what’s going on, Steve stays with Chris for a few days. When the two of them are invited to Max’s house for dinner, Steve quickly realizes Max is connected to Neal’s death. Meanwhile, Max and Steve both have fallen in love with Chris and they each ask her to leave the country with them. She turns down both of their offers and Steve is frustrated by her apparent desire to stick close to Max. When Steve tries going to the police with proof of Max’s connection to Neal’s murder, he doesn’t understand why Smythe doesn’t seem to care about the matter. Chris and Steve each carry on their investigations, but when Max and his associates find out what Chris has been doing, Steve winds up in a shootout to save Chris. 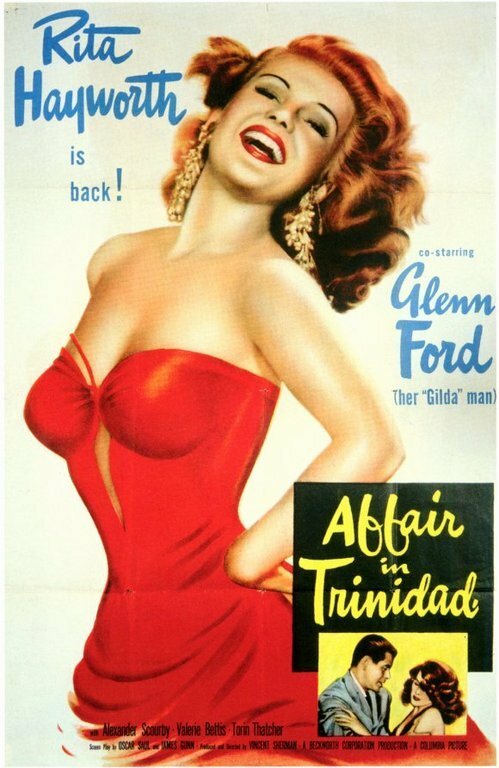 Affair in Trinidad was the first movie Rita Hayworth made after taking a four-year break from movies. From her first moment on screen, Rita proves that none of her magnetism was lost during those four years. Teaming her with Glenn Ford again was definitely a good move; their chemistry certainly hadn’t faded with time. The story is pretty convoluted, but it is entertaining and Rita Hayworth’s charisma more than makes up for a far-fetched story. All in all, a pretty enjoyable comeback movie.